Tapas at Cervecería El Trebol, Toledo. 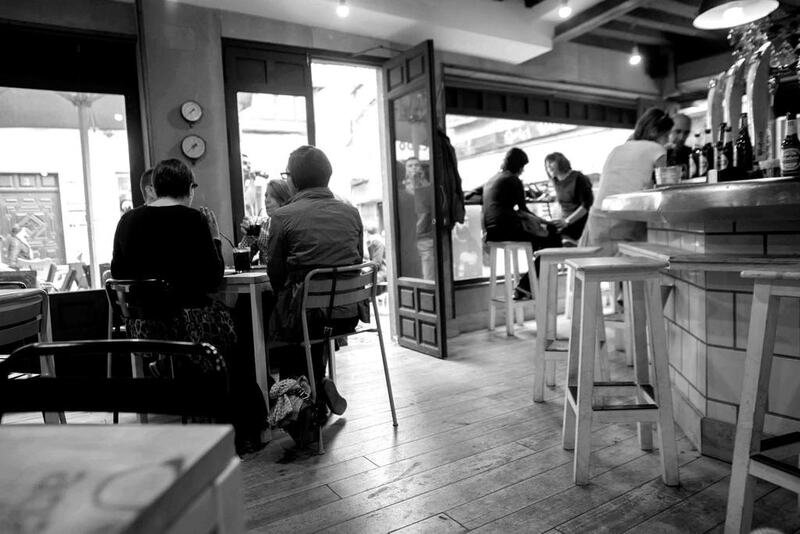 Photo courtesy of Cervecería El Trebol, Toledo. Once seen as a serious and sombre kind of place, Toledo is an increasingly vibrant town and its nightlife just keeps getting better. It may be best known as a day-trip destination from Madrid, but there’s plenty to enjoy if you stay a little longer, including the town’s night-time charms. After watching the famously gorgeous sunset, what could be better than enjoying a night out in the great – and usually inexpensive – tapas bars? Here’s our pick of the best. Tapas at Cervecería El Trebol, Toledo | courtesy of Cervecería El Trebol, Toledo. A modern Spanish bar and brewery with bags of character, Cerveceria Trebol is set over three floors. It’s the perfect place to start the evening early on, before the crowds descend, and enjoy their well-priced tapas and drinks on one of the best outdoor terraces in town – but don’t forget to peek inside at the bar’s coolest feature, a glass floor looking down onto Roman ruins. Photo courtesy of El Trebol | courtesy of Cervecería El Trebol, Toledo. 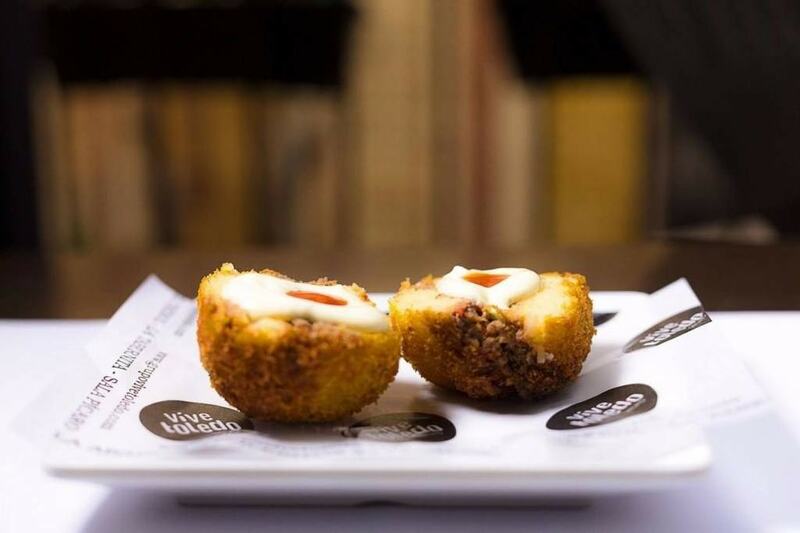 The place to go for local flavours, Cabalito is a friendly bar serving traditional Spanish cuisine with a modern twist, with emphasis on tapas from the Toledo area. It’s a perfect stop for lunch if you’re visiting the nearby cathedral, one of the city’s main attractions. It’s not hard to see why El Colmadito is one of Toledo’s most popular bars, especially with the younger crowd enjoying drinks deals and cheap but tasty pizzas, burgers and tapas. It gets packed out, especially at weekends and in the late evenings. Arrive earlier to snag a table. This laid-back local neighbourhood bar is loved for its good-quality beer at reasonable prices. Plus, this is one of the few places in town where all drinks are served with a tapa. The food is so delicious you may find yourself ordering more from the menu and lingering in the fun, relaxed atmosphere. This cool bar is one of the more modern places in Toledo’s centre and makes an interesting change from the typical tapas bars. Despite being so close to the cathedral and other main sights it has a relaxed, neighbourhood atmosphere, friendly service and reasonable prices. A perfect place to stop in for a gin and tonic after a hard day’s sightseeing, but it’s just as good for lunch. Another great value spot to enjoy wine, cocktails and a varied menu of mostly traditional Spanish fare, with the kitchen’s focus on quality ingredients being obvious despite the low prices. Their outdoor terrace is the perfect summer hangout and a great place to start your night or while away an afternoon. A quirky, modern bar with friendly staff and a handful of outdoor tables, the curiously-named La Otra Boveda (meaning ‘the other arch’) is definitely one of the town’s nicest hangouts and makes a relaxed place to meet friends in the town centre. As the name suggests, the two stars of the show at this central bar are great food and indie music. Catch one of the shows at Agapo Indie&Food and enjoy the vibrant atmosphere or just check out the affordable yet excellent daily menu, which makes it popular with both locals and visitors. Enjoy the views from this elegant rooftop bar. Terraza Bú makes an interesting change from the many typical old-school Spanish bars in town with its cosmopolitan vibe. The menu, too, offers a modern take on classic Spanish cuisine. By day you’ll find plenty of day-trippers here soaking up the sun, but in the evening it takes on a much more local vibe. Another great terrace bar, Enebro is noticeably popular with local students for its great value food and drinks and fun, friendly atmosphere. It gets packed out at weekends, when it becomes one of the liveliest spots in town.